It’s official, Andrew Luck will be playing for several NFL teams next year. He’ll play the first three games in Miami and having had a taste of the AFC East, he’ll stick around for the next four weeks in Buffalo before it gets too cold. Then he’s off to Denver for a week of mentoring from fellow Stanford grad John Elway, before a fortnight in Cincinnati. Washington will be Luck’s home after that, before a long flight to spend some time in San Francisco. He’ll end his tour in Seattle and do it all again next year. The reason for such a difficult travel schedule is simple – each of these teams is going to be picking first overall next year. Ever since free agency finally began last week, there’s been a series of knee jerk reactions from the media, fans, bloggers – pretty much everyone associated with the NFL. Every perceived bad decision has been greeted with the use of ‘Andrew Luck’ as an adjective. You could almost dub a bad free agent signing as ‘pulling an Andrew Luck’. The perception seems to be that teams are deliberately making these moves in order to be so painfully bad that they’ll become the worst of 32 teams this year. I just can’t see it like that. For starters, what if Andrew Luck breaks his leg in the final week of the college football season? It’s not a proposal I want to dwell on, because it’s a horrible thing to say about a talented quarterback. However, is it not a possibility? Is a team really going to base it’s entire 2011 NFL campaign on the possibility that Luck stays healthy and will therefore be the golden goose everyone’s decided he is? This concept that there could be as many as five or six teams battling it out to be worse than the others is comical. I would argue it’s just as difficult to become so bad you earn the #1 pick as it is to make the Super Bowl. Just look how bad the previous owners of the #1 spot have been – last season, Carolina went 2-14 with Jimmy Clausen stinking the place out as the Panthers lurched towards what they thought was a shot at Andrew Luck. He stayed in school. The year before that, St. Louis picked up just one win. One measely win, despite playing in a wretched NFC West. A truly incredible feat, even for the Rams. The year before that? Not even zero wins would’ve guaranteed you’d get ahead of the Detroit Lions to pick first overall. Miami went agonisingly close to a 0-16 season twelve months earlier, only to be rescued by an unusually terrible Baltimore Ravens outfit. The year before that? Al Davis. As I noted in this article earlier in the year, to be consistently bad is incredibly hard. For the first few weeks of last season everyone had the Buffalo Bills as a lock to be picking first overall. Against all expectation, they actually made improvements and settled for the #3 overall pick instead, affording Carolina the opportunity to swoop in and become the worst team in the NFL. Kudos to the Panthers. The Seahawks are another great example of how difficult it is to pick first overall. Despite a laundry list of injuries in 2008 (and a lame duck coach) the team still managed four wins, enough to pick 4th overall. Not first. Jim Mora came in as coach the season after and arguably made things even worse, yet the Seahawks still only ‘earned’ the 6th overall pick. There’s a reason why this team has never owned the #1 overall pick and it’s because it’s an incredibly difficult thing to do. Seattle has found it equally tough to be the ‘worst’ as it has to be the ‘best’ in the team’s entire history. So when Tavaris Jackson was signed from Minnesota to replace media darling and untouchable veteran Matt Hasselbeck, the cries of ‘Andrew Luck!’ rang aloud throughout the nation. What a terrible decision, how could they make such a desperate move? This was either an elaborate plan to get to Luck next April, or it was a short sighted decision that would get the franchise there via error. Like I said, I’m not trying to suggest Jackson will win the Seahawks that elusive Lombardi Trophy but I’ve a lot more faith in his abilities than Keith Null, Cleo Lemon and Jimmy Clausen. What’s more, the front office have actually put together the foundations of a decent supporting cast. The signing of Sidney Rice – health permitting – could be a master stroke. The offensive line could be the most expensive in the entire NFL, considering it contains two first round tackles, a former #2 overall pick at left guard, a second round pick at center and a recent third round pick at right guard. It’ll take time to grow, but the Seahawks also spent big on a coach to get them up to speed quickly. Investment has been made in a running back (Marshawn Lynch) and also the receivers (a second round pick on Golden Tate, re-signing Mike Williams and Ben Obomanu). Jackson also has his former offensive coordinator calling plays and knowing his strengths/limitations. Of course, Jackson is also familiar with the team’s new star at receiver. OK – Jackson might never develop into a great quarterback, but the Seahawks have done pretty much everything physically possible to at least make life a little bit easier for the guy. Can the same be said of Cleo Lemon in Miami? How about Keith Null and Daunte Culpepper? I appreciate the Seahawks’ schedule is insanely difficult with four games against the tough AFC North, four games against the equally daunting NFC East and games against the top placed teams in the NFC. Have we also forgotten Seattle annually plays six games in the weakest division in football? As of today I would suggest there are three teams much more likely to pick first overall. Cincinnati are my favorites – they’ll be starting an over rated rookie quarterback in Andy Dalton, they’ve lost players like Jonathan Joseph to free agency and they’ll be playing Pittsburgh and Baltimore twice each. Andrew certainly will need some Luck playing for Mike Brown (don’t go to Carson Palmer for advice, unless you want to pull an Eli). Denver picked second overall last year and haven’t done an awful lot to improve their areas of weakness. Oh yeah, they also appointed the coach that led Carolina to the #1 pick last year (although John Fox, in fairness, was a lame duck). It could be worse I guess… Jim Mora could’ve accepted that position as defensive coordinator. Then there’s Washington, who brought in a lot of rookie’s during the draft but lack a lot of proven talent. The offensive line is poor and still growing and they haven’t got any playmakers. They play in the NFC East. They have John Beck and Rex Grossman at quarterback (suddenly Tavaris Jackson doesn’t sound all that bad). The Seahawks will have to be especially unfortunate with injuries (not unrealistic) and be completely devoid of fortune (more unrealistic) to select first overall. Whatever anyone says about the team last year – and I firmly believe they over achieved on the whole – the effort was there every single week. That team never gave up, even if at times it was seriously outclassed. I have a hard time seeing this coaching staff, this front office and this group of young individuals performing to a level that ‘earns’ the first overall pick. Can I see five or six wins given the schedule? Sure, but that will only be good enough for a place in the 5-12 region of the first round. I think it’s testament to the way Pete Carroll is rebuilding this team that they’ve already moved beyond being old at key positions, injured or just bad – and now the problems are inexperience and a smattering of key areas that could use investment in the future. The time to be awful was last year when the team really had barely anything but special teams to hang it’s hat on. They still won the NFC West. Now the time has well and truly passed to pick first overall with a solid off season despite the lockout. As I said – I could still see the Seahawks finishing bottom of the NFC West, or at least third. There’s a long way still to go from being a contender in the NFC, but that is on the horizon if they can add to three key areas for the long term – quarterback, pass rusher, cornerback. That’s still a huge step to take, of course. Even so, there’s enough talent elsewhere to at least avoid being the NFL’s 32nd best team. So if the Seahawks are going to have a shot at Andrew Luck next April, they’re going to have to be willing to pay two or three first round picks to get to that #1 spot. The Seahawks might not be great in 2011, but they’re not going to be bad enough to get Andrew Luck. During my conversation with Southern Miss quarterback Austin Davis, two things became evidently clear. Firstly, that he understands what it will take to get to the next level. Secondly, that he’ll do what it takes to get there. 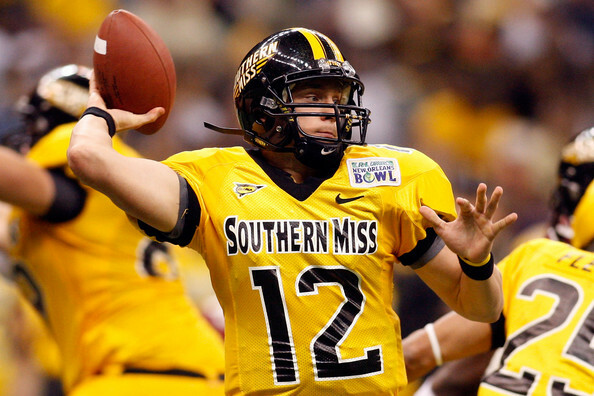 Davis is the most prolific quarterback in Southern Miss history. He holds several school records, including most passing touchdowns (53). That record formerly belonged to Brett Favre. He enters his senior season looking to guide the Golden Eagles to a conference title game while impressing on-looking NFL scouts. He’s on the Davey O’Brien watch-list and will only improve his reputation if he can lead a developing and increasingly talented Southern Miss roster to an unbeaten season, something that’s well within their reach. I wanted to speak to Davis in advance of all the serious draft talk. In many ways, this is the best opportunity we get to find out about them. Everything a player says and does during draft time is scrutinised and they’re fully aware of what’s at stake. Quarterbacks in particular get a grilling because teams want to know they can trust these guys not only to be the face of their franchise off the field but also the leader on it. Answers end up being rehearsed, staged and repeated. Players tred on egg shells and wax lyrical about character, leadership and such like. It’s comparable to a series of job interviews, just filmed and recorded for thousands of people to observe and judge. So what did I find about Davis? You can tell he’s ambitious and wants to play at the next level but he’s equally aware it’ll be a big challenge. When he spoke about being a leader, competing and working to achieve his goals – it was done with sincerity. I asked him about the Manning Academy which took place earlier this month. Davis attended along with a lot of the big names in college football including Andrew Luck, Landry Jones and Kirk Cousins. He left an impression, reportedly drawing rave reviews from Archie Manning. In the ‘Air it Out’ competition at the camp (which tests quarterbacks to hit moving targets) Davis progressed through two rounds to make the final, where he competed against Oklahoma’s Jones and eventual winner Collier Winters from Harvard. The training academy was a worthwhile experience for many reasons – a chance to work with Peyton and Eli of course, but also to spend some time with the other young signal callers who will make up the 2012 draft class. And on having the chance to work with two of the NFL’s best? There’s a lot to like about Davis from a pro-perspective. In the 2011 draft, six quarterbacks were taken in the first 36 picks – all with a certain degree of mobility. Davis is a similar athlete, capable of making plays to compliment the running game or by extending plays in the pocket. We’ve witnessed the Seahawks focus on mobility with their quarterback additions most recently and more than ever teams are looking for guys who can move around and if needed, get out of harm’s way. He acknowledges the importance of arm strength and says he’s worked to get stronger in anticipation of the next step. He played at around 208lbs last season, but has added weight to increase his overall strength. It should pay off when the season begins. Of course it’s not just about physical qualities and the NFL demands a high degree of accuracy. It’s a contradictory storm of needing your pro-quarterback to take chances and make things happen down the field, while also viewing turnovers as the cardinal sin. Luckily, Davis is already speaking with a level of maturity about that situation. It’s advice that’s worked well so far. Davis only had six interceptions last year and has 16 for his career overall – a total some quarterbacks will throw in a single season. He was still able to achieve a healthy seven yards per attempt in 2010 while recording 3103 passing yards and completing 63% of his passes. His twenty passing scores were enhanced by a further ten on the ground – and he even managed a spectacular touchdown reception on a trick play in the Beef O’Brady Bowl defeat to Louisville. When you’re scoring 31 touchdowns in a season and only throwing six interceptions, you’re doing something right as a quarterback. They might happen on NCAA 12 but interceptions are not something the Golden Eagles fans have come accustomed to seeing from the real life version of Austin Davis. While he himself has touched on the possibility of people suggesting it’s a conservative approach, that’s not the impression I had when watching Southern Miss. He’s a capable passer who won’t be physically restricted at the next level. His level of focus in limiting turnovers is purely another positive and something he’ll have to take into the NFL to succeed. If you’re afforded the opportunity to watch Southern Miss in the upcoming new season of college football, take the opportunity to take a look at their quarterback. Next year’s draft class at the postion is already being vaunted by the media, largely due to the hype surrounding Andrew Luck (most of which is fully deserved of course). However, there are other guys out there and Davis in particular deserves attention. Of course, there’s still a lot of football to be played before the process begins again next year – and Davis understands the importance of taking things one step at a time. The NFL, for now at least, will have to wait. Will the Seahawks take a look at Antonio Cromartie? For starters, you don’t need to be a dynasty to win the weak NFC West. If you are solid, consistent and good at home – you’ll win the conference. The fact you have the opportunity to play six games against NFC West opponents also helps in terms of playoff seeding. If you’re in the post season regularly, you’re a contender. If the Seahawks are playing playoff games at home, even more so. I think this off-season has been a unmitigated success so far. I’m not a ‘homer’ who backs every decision this team makes, far from it. Neither am I overly critical, but certainly I would like to be considered a realist. I felt the Seahawks had to move on at quarterback and rather than assume a 36-year-old often injured Matt Hasselbeck was far better than any other option, I think the Seahawks made the right choice to at least try and turn over a new page. This team is not building around Hasselbeck or even a quarterback with his current skill set. I understand the popularity he enjoyed and deserved in Seattle, but let’s be brutally honest here – Matt’s reputation and general ‘great guy’ personality is the only thing separating him from other ageing (and struggling) quarterbacks like Donovan McNabb. I’m a big proponent of the receiver position and feel it’s vastly underrated by fans who clamour for ‘building in the trenches’ as the only way to success. I don’t mean you can’t build a team with strong line play, but looking at recent Super Bowl teams like Pittsburgh, Green Bay, Arizona, Indianapolis – none of these teams had the kind of elite line Seattle enjoyed in XL. There are many ways to skin a cat – so the saying goes – and that is true in the NFL. Playmakers compliment an offensive line just as much as an offensive line gives the playmakers the opportunity to produce. As it happens the Seahawks have tackled both areas. The offensive line is now one of the most expensive in the league as not many teams will start two recent first round picks at tackle, a free agent guard who was a former #2 overall pick, a center drafted in the second round and a right guard drafted in the third after a move down from round two. That is some serious stock spent on your offensive line. But the signing of Sidney Rice was equally as vital in my view, as was the re-signing of Mike Williams and Ben Obomanu, the drafting of Golden Tate and the Marshawn Lynch trade. Playmakers are vital. You need someone who will draw coverage and make a defense think twice about stacking the box. You need someone who can stretch the field. You need someone who can be a reliable security blanket who you KNOW is going to catch several passes a game. The Seahawks haven’t had that for many years and without Mike Holmgren running his precision offense that generated the numbers, they needed a big time receiver. Rice will be 25 in September – coinciding with the time he should be hitting his prime. He has all the tools – except perhaps blistering speed – to be an elite receiver. His presence will not only aid the much desired improvement in the running game, he’ll open up a lot more opportunities for the likes of Williams and Tate. Was the price high for Sidney Rice? Yes, but I’d rather gamble on salary than draft stock and Rice cost absolutely nothing in terms of picks. Brandon Mebane appears close to agreeing terms with the Seahawks, filling a gigantic hole (literally and figuratively) in the defensive interior. Losing Mebane would make little sense for a franchise hoping to build around players reaching their best years at the right age so it’s a good sign he will be staying in Seattle, albeit probably at a premium price. Suddenly a team with no key players, nothing to make an opposition team fearful… actually has quite a few pieces to the puzzle. Due to this belief, you suddenly want more. When Seattle’s name suddenly cropped up regarding Nnamdi Asomugha – I felt myself dreaming of an elite addition to the defense. Many fans started to talk about Vince Young believing he could offer more than Tavaris Jackson or Charlie Whitehurst at quarterback. Even if they hadn’t necessarily noticed, I think Seahawks fans were getting their hopes up – including those who were very disappointed following Hasselbeck’s departure. This brings me onto the three areas I think need to be filled for us to realistically believe in this team – not just in the NFC West, but in the NFC. The Seahawks did the right thing moving on from Matt Hasselbeck in my view, but nobody can hide behind the fact that the current two quarterbacks on the roster have major question marks hanging over them. Maybe one of Jackson or Whitehurst grabs this opportunity and runs with it? We’ll find out soon enough. Even so, the situation remains unresolved as of today in terms of filling a long term need that should’ve been addressed ages ago. People point to next year’s draft and certainly I have some optimism for Andrew Luck, Matt Barkley, Landry Jones, Austin Davis and Kirk Cousins. The rest of the class? Not so much. The Bengals have big needs. If you want to try and solve one of those needs, one option is a trade. The Bengals have been bystanders in free agency, losing their top free agent Jonathan Joseph and trading Chad Johnson. Putting Palmer on the ‘did not show’ list won’t help them make up the cap limit but trading him for a veteran will. If you’re trying to drive a hard bargain, then reiterating a stance of ‘no deal’ via a much publicised press conference is one way to do it. If the Seahawks want a quarterback who can still get it done in the NFL, who can add veteran leadership and be an excellent bridge option to the future, then put together a package that will get this done. If it creates other holes at the same time, well isn’t that what free agency is for? Perhaps next year’s draft will provide the answer instead, but it’s an area that will be addressed. Chris Clemons had an excellent year rushing the passer in 2010 and will be the teams top LEO this year by the looks of things. Keeping Mebane and adding Alan Branch improves the quality/depth ratio on the defensive line but with Raheem Brock in limbo, the Seahawks need to see what else is out there. Ray Edwards is unsigned and Osi Umenyiora could be traded. The Seahawks were linked to both before free agency began, but haven’t been mentioned in relation to that pair since the lockout ended. The LEO position is designed for sack production and Pete Carroll may believe it’s an area that doesn’t require major free agency dollars. Even so, can you imagine a line with another proven pass rusher included? Beyond Edwards and Umenyiora (and it’s important to remember both have played alongside other very talented players in Minnesota and New York) there aren’t a ton of alternatives. However, either would fit comfortably into the rotation, they have the right size and skill set. Can a deal be done? Who knows. This may be an area that gets the treatment in the future, but there are options open for the Seahawks to explore now if cap room allows. *Update* Ray Edwards agreed to join the Atlanta Falcons today. Marcus Trufant will be 31 in December and hasn’t reproduced the form that earned him a Pro-Bowl selection in 2007 and a fat new contract. Injuries have played a part, but at times he’s been a liability in coverage and has become prone to penalties. A better defensive line and improved T.O.P. from the offense would help, as would greater support in the secondary. Trufant has been flanked predominantly by Kelly Jennings the last few years and could line up across from untested sophomore Walter Thurmond this season. Eric Wright, Jonathan Joseph and seemingly Nnamdi Asomugha are out of contention in free agency – but Antonio Cromartie remains available. For all his criticisms, he’s a good starting corner in this league who matches the size criteria set out by the Seahawks. He likely won’t return to New York if they sign Asomugha. Of course, having invested a lot in the secondary during the most recent draft (albeit with later round picks) the Seahawks may be happy to give their young guys a chance to compete and ultimately start. Is a combination of a Palmer trade, defensive end signing and cornerback addition too much to ask from this single free agency? Almost certainly. It’s Madden ’12 territory. Pipe dreams. If they find a way to pull it off in the next 12 months though, then teams are going to start giving the Seahawks a lot more respect. Before I get into this piece I want to set up two things. First of all, I had the opportunity to speak to Austin Davis (QB, Southern Miss) today. Regulars will know I’ve been promoting his talents for a while now as a guy who deserves a lot more attention in terms of the draft. Expect the feature on Davis to appears on the blog in the next couple of days. I can testify that he’s as impressive during interview as he is quarterbacking the Southern Miss offense. Secondly, I wanted to recommend this piece by Brandon Adams at 17 Power offering a perfect and considered summary of Matt Hasselbeck’s departure and the current quarterback situation. Brandon is an exceptional writer so go and visit his blog. The Seahawks quarterback situation lingered in the air like a bad smell throughout the lockout. At times the debate became quite heated as fans, the media and sometimes even the players chimed in to discuss the future at the position. Would Matt Hasselbeck return? Should Matt Hasselbeck return? Will the Seahawks make a trade for Kevin Kolb or Carson Palmer? Is it time to see what Charlie Whitehurst has to offer? Endless debate that often went round in circles. ESPN’s Trent Dilfer touted Tavaris Jackson around draft time, confirmed at a later stage by John Clayton that he was indeed on Seattle’s radar. We now know that Hasselbeck will be a Tennessee Titan and probable starter for the next two years health and form permitting. We also know that Jackson and Whitehurst will seemingly start training camp fighting to be the starter. I suspect Jackson has the edge. After all, his former offensive coordinator is now in Seattle. The Seahawks have agreed a deal with Sidney Rice, pending a medical which seems a formality if terms have been agreed and anounced. If you check out Jackson’s own web page, he lists Sidney Rice as one of his closest friends in football. He has the experience – twenty NFL starts compared to Whitehurst’s two. It appears Pete Carroll is handing a lot of responsibility to his coaches. Tom Cable had a lot of sway during the draft where Seattle spent their first two picks on offensive lineman. The Seahawks confirmed today that they’d signed Cable’s former protege Robert Gallery to play left guard. Bevell has clearly had some influence in the team’s decision to not only sign Jackson, but also target Rice. So this is the situation at quarterback – Jackson or Whitehurst. Frankly, it’s a mess that should’ve been avoided. Let me qualify that statement by making it clear that I see this ‘mess’ as one inherited by Pete Carroll and John Schneider. They were correct not to commit significant years and salary to a 36-year-old starting quarterback who in fairness does not fit the athletic and physical qualities they want to build their offense around. If the idea is that this team is rebuilding and won’t peak for a year or two (or three) then why not take a look at some other guys? It’s not losing for draft stock, it’s called moving on. However, it should’ve been much easier to move on. They should’ve been able to avoid all this drama. Why? Because the previous regime should’ve drafted a quarterback. The current situation is systematic of the negligence of the past. In 2009, the Seahawks should’ve drafted a quarterback in round one. Tim Ruskell and the front office viewed a 4-12 record and the fourth overall pick as almost a luxury. The poor season in 2008 was purely down to injuries – whether that was to Matt Hasselbeck, the offensive line or pretty much every single wide receiver on the roster. “We’re better than that” and “We’ll be healthy and return to form” were opinions taken. This was a team that had been perennial NFC West champions after all. This was a steal! The Seahawks, Super Bowl runners up just a couple of seasons removed, pinching a top-five talent. What a rare and exciting opportunity to spend a top-five draft pick this was. Tim Ruskell and his scouts decided it was a chance to grab the top guy on their board who fit all of their criteria. Of course, that also meant the top guy that made it through the many layers that Ruskell insisted upon with his picks (four year starter, big school, good character etc). The decision was made to draft Aaron Curry, a move much loved by the media and a large portion of the fan base. It’s not just with hindsight that we look back and almost collectively see that was a massive mistake. A few argued such at the time (ahem). Essentially, it was a short term move. Curry was awarded the usual tags of ‘pro-ready’ and ‘safe pick’ with the assumption being his position (linebacker) was easy to learn. There were no character concerns and he performed brilliantly in work outs and during the combine, so Seattle drafted a $60m linebacker and hoped he would hit the ground running. Get everyone else healthy, fill holes with wasteful free agent cash (TJ Houshmandzadeh) and go for wins. They had to manufacture the positional need by trading Julian Peterson (who admittedly was reaching the end of his prime) but Curry was a can’t miss prospect! How could it go wrong? Well for starters, Curry had no history in college of pass rushing ability. He wasn’t even asked to rush the passer, often standing deep behind the line of scrimmage and acting as a heat seaking missile to the ball. Curry recorded nine total sacks in four years at Wake Forest. Pass rush isn’t the be-all and end-all, but if you’re spending $60m on one defensive player, you generally want him pressuring the quarterback or shutting down one side of the secondary. Not many teams spend big at linebacker in a 4-3 scheme. Curry had all the athletic qualities, but not the instinct. He looks like a player who has worked to become a great physical specimen but ultimately plays like the third round grade he was given by the draft committee prior to his senior year. What happened in 2009 after drafting him? The Seahawks weren’t quite as good as some thought. This was an ageing team with key players either already gone (Shaun Alexander, Steve Hutchinson) or getting close (Walter Jones, Patrick Kerney). Matt Hasselbeck was also getting close to the end of the road. When the 2009 season began, Hasselbeck was approaching his 34th birthday after an injury plagued previous season. He had two years left to run on his contract. That absolutely was the perfect opportunity to draft a guy, let him sit for two years and be the natural successor when Hasselbeck’s contracted ended after the 2010 season. A plan for tomorrow, some forward thinking at the most important position in football. It was the ideal moment to draft a quarterback. If Ruskell and co. believed the team were better than their 2008 record suggested, then replace Julian Peterson with a younger and cheaper option (they found David Hawthorne as an UDFA) and let the quality of the team you believe in afford you the opportunity to bank a quarterback for the future. Of course it’s easy to look now at Mark Sanchez (drafted 5th overall) and say that should’ve been the pick. He’s performed at least to a satisfactory level to get the Jets to successive playoff berths despite never having a chance to sit and learn. Josh Freeman is another. I never seriously considered Freeman to be an option for the Seahawks at #4 given his lack of polish as a passer – even despite the fact he worked out in Seattle prior to the draft. I graded him in the top ten of a few mocks but actually had him going to the Jets in the teens when all was said and done. Two quarterbacks who have both had significant impacts for their team. Two quarterbacks who have started quickly. Two quarterbacks who are the future of their teams. And yes, hindsight is great. But we can safely say the previous regime blew this one. Rather than awaiting the Sanchez or Freeman era in Seattle – with either having had two years research on living like a pro – it’s the Tavaris Jackson and Charlie Whitehurst show. A major missed opportunity to take a chance on a quarterback for the long haul. Carroll and Schneider can do nothing but make the most out of a bad situation. They may get an opportunity to get this right in the future. However, it’s actually very difficult (even with Jackson and Whitehurst) to ‘earn’ a top five pick. Seattle were just as poor in 2009 as 2008 and only managed the 6th overall pick after a 5-11 record. Playing in the NFC West makes it even harder to be so bad you finish with the 0-4 wins you might need to pick from the cream of the QB crop. Would that be enough to get Andrew Luck in 2012? No. It may not be enough to get Matt Barkley either should he declare. And this dire situation was all created by the absolute neglect of any forward thinking at such a key position. A cog to build around and continue Seattle’s NFC West dynasty lost. An expensive linebacker acquired instead. No obvious answer to who can be the next great Seahawks quarterback after Matt Hasselbeck. Let’s hope it can be solved soon. With the signing of Sidney Rice and major investment in the offensive line/running game, the Seahawks have created a good environment for a quarterback to thrive. Maybe that can be Jackson or Whitehurst? Or maybe it’ll be a different player not currently on the roster to be acquired or drafted later. Michael Huey (OG, Texas) has signed for the Seahawks as an UDFA. Seahawks Draft Blog revealed the team’s interest in the former Longhorn, confirming the news in this article last week. You may also remember this piece in May that touted two potential free agent signings via a cryptic musical clue. Huey was the ghostbuster’s reference. The same source revealed interest in Houston Texans full back Vonta Leach (who name checked the Seahawks as a potential home last week). All the talk today is that Hasselbeck will not be staying in Seattle. There’s been speculation about a big offer on the way from Tennessee and Michael Lombardi reiterated that suggestion. Steve Young put the 49ers into focus yesterday by suggesting they could be a possible suitor. Danny O’Neil lists the Seahawks among interested parties and it seems clear he at least remains an option for Seattle. No deal can be completed with anyone but the Seahawks at this stage, so if Hasselbeck is staying in the PNW it could be concluded before free agent deals can be officially announced. I suspect the situation remains fairly fluid – the Seahawks don’t want to commit too much money and years to a soon-to-be 36-year-old quarterback with recent injury history and a not spectacular statistical record. At the same time, they don’t want to cut their nose off to spite their face at the quarterback position. If Hasselbeck gets a remarkable deal elsewhere, he’ll have to weigh up the offer (if it remains) from Seattle and decide what is the best move. That could be staying with the Seahawks. The Bengals held a press conference today fronted by owner Mike Brown who reiterated his stance on not trading Carson Palmer. The general reaction is that the concept of a potential trade is now dead. It’s a hard sell to argue anything else at this stage. Palmer could still force the Bengals hand by turning up at training camp, absorbing a salary of $12m and making life difficult at a time when the Bengals wish to move on. The statement today may even have been an attempt to call the quarterback’s bluff on retirement. And let’s be honest, if you’re not faced with a brilliant offer at this stage, why rush if you’re Cincinnati? You have your replacement quarterback. Problems only start if Palmer decides to show up and I understand he’s in Cincinnati today and met with the Bengals owner. Nevertheless, a deal hasn’t been completed and we’ll have to wait and see if Palmer rides off into the sunset or not. No trade as of yet between Philadelphia and Arizona. The Philadelphia Inquirer is reporting that the Seahawks remain a possible trade partner. Jason La Confora believes the Eagles would want a first round pick from Seattle. Either way it appears to be a two-horse race with two NFC West rivals being used to drive up the price. This twitter account namechecking the NFL Network even insists Seattle has over taken Arizona in the Kolb stakes. Trading the #25 overall pick for Kevin Kolb in the 2011 draft would’ve been understandable. It’s a similar range to where he was originally drafted by the Eagles and it would’ve at least enabled Seattle to invest in the long term future at quarterback. Trading an unknown first round pick in 2012 is a completely different situation and should be avoided at all costs. For example, if Kolb struggles in year one without the assortment of offensive weapons he enjoyed in Philly, he could end up costing a top ten pick. That would be a hard sell for this front office and could forever define the new regime, particularly if it prevented the Seahawks drafting a top young passer in the draft. That’s a huge gamble. Of course the other angle is should success come Seattle’s way in 2011 with Kolb under center, then it was a risk worth taking. The stakes are high though. While the mayhem ensues around free agency, Whitehurst quietly arrived at the team’s facility today and will be the only quarterback available for the team when training camp begins on Wednesday. His position may strengthen simply by being the man on deck. We’ve stressed before that the Seahawks maintain faith in Whitehurst – they traded for the guy. He may get his opportunity after all. For the sanity of fans accross the NFL and in particular Seattle, let’s hope this drama has a (positive) ending very soon. Teams can sign their own free agents from tomorrow, which means if Hasselbeck is staying in Seattle there’s no reason to believe it won’t be concluded before training camp begins on Wednesday. He has the opportunity to test the water and see what alternatives are out there. If the Seahawks maintain interest in re-signing the quarterback (as I understand they do even if he isn’t necessarily the first choice at this stage) then it should be sorted swiftly. Hasselbeck has a lot of history with the team and the city. He’s respected in the dressing room and the organisation in general. He’s a spirited leader who still has the spark to compete at this stage of his career, as emphasised in a strong playoff victory over New Orleans in the post season. A case can be made that Hasselbeck has familiarity within the team, particularly the receivers, and would maintain a status quo as the offense rebuilds. At the same time we’re talking about a soon-to-be 36-year-old who would be the oldest starting quarterback in the NFL. Can you build an offense around a quarterback that essentially won’t be there when it peaks? As ESPN’s Mike Sando pointed out recently, Hasselbeck has the lowest passer rating since 2008 among quarterbacks with at least 35 starts. He’s thrown 34 interceptions during the last two years of regular season play and suffered a spate of injuries in the process. Would re-signing Hasselbeck simply delay the inevitable parting of ways? And can you justify a new contract beyond 2011 considering his age and injury record? New Seahawks offensive coordinator Darrell Bevell is a protege of Andy Reid in Philadelphia and the scheme used by both he and Brad Childress in Minnesota was very similar to that used by the Eagles. The Seahawks likewise want to utilise a mobile quarterback who can get the ball downfield and extend plays. Philly have used Donovan McNabb, Michael Vick and Kevin Kolb. Minnesota used Tavaris Jackson and Joe Webb. The Vikings adapted slightly for Brett Favre, but that’s understandable. Kolb would have a very good grasp of what the Seahawks want to do going forward in what remains a Pete Carroll ideology for the offense, with Bevell calling the plays. He fits the mantra physically for what Carroll wants in his quarterback and he’s taken time to learn the pro-game. If the Seahawks traded for Kolb, they’d be making a much needed long term commitment at the quarterback position. The question is – can Kolb justify the commitment? Look at this footage from the NFL Network’s playbook series. Mike Mayock didn’t necessarily agree with the critique and made this defense the following week. However, there are legitimate concerns. He has a slingy action, he’s been inconsistent as a starter – with turnovers and performance – and he’s suffered injuries. Trading for Kolb would likely be expensive in terms of compensation and then a big contract extension. Not to mention, if he fails the Seahawks are left with an costly bust that could define the Pete Carroll era. It seems like Kolb is destined for Arizona, but the Seahawks have maintained interest throughout and could still make a late move. After all, they fought Arizona for Charlie Whitehurst. Seahawks Draft Blog has been reporting trade talks between Seattle and Cincinnati for a long time now. The parties talked through a deal and we’ve received information that a trade could be forthcoming. We also understand that Palmer is Pete Carroll’s preferred option at quarterback. We’re not the only ones who aren’t ruling out a trade either – Sam Farmer at the LA Times suggested it could happen, Pat Kirwan reported only this week that he’d spoken to a Bengals source that suggested Mike Brown was not totally against a trade, former Bengals receiver and current NFL analyst Chris Collinsworth suggested Brown will trade Palmer and Shawn Zobel reported earlier this month that league insiders were assuming Palmer would be dealt. It could be an ideal bridge option if the Seahawks intend to draft a quarterback in the next two years. He’s four years younger than Matt Hasselbeck and has previous history with Pete Carroll and leading receiver Mike Williams at USC. His stats were admirable last year despite the Bengals record and brutal schedule which included games against Baltimore (x2), Pittsburgh (x2), New England, Indianapolis, the New York Jets, Atlanta, Tampa Bay, San Diego, New Orleans and Miami. In 2009, he went 6-0 in the formidable AFC North and won the division. He’s also suffered injuries like Matt Hasselbeck in recent years and never truly maxed out his potential in Cincinnati as a former #1 overall pick. For every person suggesting a trade is possible, there are ten people willing to tell you there’s no chance Mike Brown cuts a deal. If the Seahawks can acquire Palmer for the price we reported – a 5th round pick and a conditional 3rd – then it’s an ideal bridge option to the future. The question is, will the Bengals make the deal? Bring up Charlie Whitehurst and the over reactions can be heard all the way on the Moon. The Seahawks made a bold move to trade for the former Clemson Tiger last year, trading a cumulative third round pick to keep him out of Arizona. They held a press conference to announce the trade and it seemed, at least in essence, that a quarterback competition was beginning. Instead, Whitehurst never really came close to unseating a struggling Matt Hasselbeck at any point during the regular season. Our sources report that the Seahawks top brass maintain a level of faith in Whitehurst. In certain circumstances, they’d be prepared to enter the 2011 season with him as the starter. Whether that actually happens or not is anyone’s guess at the moment, but the front office is faced with a situation where they traded and paid a quarterback for two years work and received very little for the investment. Although he’s faced a lot of criticism, in neither of his stints in the NFL has he received the opportunity to take starting reps and really lead a team as the bona fide starter. Some will suggest there has to be a reason for that, others will question whether he was ever realistically going to beat out Billy Volek in San Diego or Matt Hasselbeck in Seattle. The worst case scenario if Whitehurst fails as a starter is the knowledge of that in itself and a high draft pick. The benefit of him succeeding could be a medium or long term starter at quarterback. It’s not a crazy option. The rumor mill exploded last week when John Clayton suggested Jackson could be the team’s starter in 2011. He reiterated that point today on 710 ESPN Radio, even going as far to suggest signing him would be at the expense of Matt Hasselbeck on a handsome $6m per year contract for the next two seasons. It’s an easy association to make because Jackson previously worked with Darrell Bevell and has the physical and athletic attributes the Seahawks are looking for in a quarterback. Even so, his name has never come up in any conversation I’ve had with our sources and it just seems a bit too much like connecting the dots. Could he be signed as competition and a potential replacement for JP Losman? Sure, that makes a lot of sense. Will the Seahawks be investing $12m in Jackson to be their starter for the next two years? I find that very unlikely indeed, even as a bridge option and a low-risk gamble. If they’re going to go in this direction, I suspect Whitehurst will be given every opportunity to win the starting job during training camp. Thomas Beekers wrote an interesting piece at Field Gulls today, discussing the LEO position and how it relates to run defense in Seattle’s scheme. It’s a subject I have a lot of time for, because I’ve long stressed the impact on run defense if you’re going to use a floating specialist on the defensive line. It doesn’t really matter who you play on that side, at 250-265lbs you’re giving something up against the run. A lot of potential LEO candidates that were talked about in the 2011 draft class, in my opinion, were never considerations because their run defense was so poor. Trying to find someone who can limit the damage on running downs and provide a spectacular pass rush isn’t easy and it’s why there’s more to the LEO than simply a lack of size and decent speed off the edge. Beeker’s evidence shows that teams didn’t target Chris Clemons, who was the designated LEO rusher for the Seahawks and enjoyed a career year for sacks in 2010. Opposing teams ran to the left as often as the right and didn’t utilise the lack of size on one side of the defensive line. To some extent I think that’s testament to Clemons but I’m loathe to be overly positive about his performance against the run, because it would be false praise. However, he wasn’t awful and alongside his sack production really the Seahawks went some way to justifying their scheme and usage of the LEO at least for 2010. As I touched on earlier, when scouting players in the 2011 draft I found very few top-end LEO pass rush candidates that I wanted to put in Seattle’s system. My favorite by a long stretch was Jabaal Sheard who ended up in Cleveland. Not only did he have the necessary strength and surprising run defense potential for a guy playing at 264lbs, but he had the speed off the edge and a repertoire to keep things interesting. In many ways, he could be the ideal LEO rusher. Brooks Reed was another candidate with similar abilities and higher up the board, Aldon Smith could’ve slotted into the role. The likes of Von Miller, Robert Quinn, Justin Houston, and Adrian Clayborn didn’t appear to be as logical options because of that needed combination of speed + strength, although I understand the team did like Clayborn even if he was never a likely draft pick for the Seahawks. Looking ahead to the 2011 draft, one player I’ve often spoken about on this blog that excites me a lot is West Virginia’s Bruce Irvin. He played last year as a third-down specialist and earned 14 sacks in limited playing time as a former JUCO transfer. This year, he’s expected to take on a larger role. At 235lbs he’s too small to play as part of a front four, yet there’s so much potential there if he could add 15lbs. We’ll need to see what weight he’s playing at when the season starts and he may already have added weight for his new extended role. Even at 235lbs, he flashed the kind of surprising strength that sparked my interest in Sheard but Irvin’s a much more explosive pass rusher. He often talks about ‘Beast Mode’ on Twitter and certainly Irvin plays the game the same way as Marshawn Lynch. It’s not just about pure speed and power either, Irvin has elite hand usage and a complete repertoire of moves. There really are no limits to his potential and it’s encouraging to see him flat out beat a guy off the edge with speed on one down, then engage a lineman on the next play before cutting inside and attacking the middle. Here’s another video compilation courtesy of TMB Draft featuring plays against NC State, Connecticut and Maryland. Irvin has big-time potential and could lead the nation in sacks this year. He is the one LEO candidate I’m pushing this summer and absolutely he has a lot of potential to compete in Seattle’s scheme. Bengals playing hardball on Palmer? Today I received the first indications that Cincinnati may be playing hard to get over Carson Palmer. Although I understand the teams previously agreed on a price – set at a 5th round pick and a conditional 3rd rounder – a source separate to the ones we’ve been using on this story has suggested the Bengals are now asking for more. The price in question is so high that it’s unlikely a deal would be completed under those terms. We’re told that Carson Palmer still remains Pete Carroll’s #1 choice at quarterback for next season. I have contacted my original sources for more information to see if this is the case. Stay tuned. Chris Sullivan at Thirty Acre Fortress tweeted information today from a source suggesting Carson Palmer was Pete Carroll’s #1 choice to be the Seahawks starting quarterback next season. He also suggested any such deal would be dependant on price. The information goes along with what we’ve previously reported on this blog. A lot of the talk amongst Seattle’s media over the last 24 hours has been based around a report from John Clayton that the Seahawks may decide against making another offer to Matt Hasselbeck and that Tavaris Jackson could be signed as a replacement starter. None of the sources we use have suggested the team are ruling out keeping Hasselbeck in Seattle. Far from it in fact. I’ve long maintained on this blog the feeling that Palmer or Hasselbeck will be the team’s starter next year. Could they sign Jackson to replace JP Losman as competition and backup? Sure. However, the concept of Jackson signing to start is unrealistic and is not a suggestion our sources have made to us. The connection is obvious because Darrell Bevell worked with Jackson in Minnesota, but that alone is not reason enough to suggest a deal is imminent. Repeatedly the two names that have cropped up in discussion with our sources are Palmer and Hasselbeck, which does make complete sense. They’re both veteran starters, they are both potential bridge quarterbacks. Palmer has a significant age bonus of four years, but Hasselbeck has familiarity with the team. I understand – and have had this validated by others – that the Seahawks would’ve been willing to use the #25 overall pick in this year’s draft on a quarterback before the lockout arrived on the scene. They were willing to use that pick to pay Cincinnati for Palmer and went back to the negotiating table with the Bengals after learning they could sign the younger Kevin Kolb for the same price. Cincinnati – who are more willing to deal than many people assume – eventually settled on a package of picks believed to be a 5th rounder and a conditional third. It wasn’t just Seattle’s purported interest in Kolb that saw the price drop dramatically. Palmer’s huge contract, nessecity to re-negotiate to confirm a trade and desire to move to the Pacific North West also played a part. The Bengals don’t want to be left paying such a big contract or potential drama if Palmer tries to force a trade by turning up to camp. With a salary cap floor included in the new CBA, this also creates a major potential pitfall with Palmer holding all the cards. Have things changed since those discussions between the teams months ago? I’m not sure and of course I wouldn’t rule it out. I’m not completely naive to think Mike Brown isn’t capable of putting a spanner in the works. Even so, he wants to move on. Both Palmer and the Bengals mutually agreed to do so at the end of last season and the media war that followed came about because the team held a press conference announcing Palmer had requested a trade. I can only presume this move was made to orchestrate a strong bargaining position, making it seem that the Bengals had not initiated a potential deal and could drive a hard bargain. Palmer’s response was, as we know, to threaten retirement and stop the Bengals receiving any compensation. Mike Brown’s stance has predictably been ever since, ‘go ahead’ and why not seeing as no trade can be completed during a lockout? So this is my projection based on what I’ve sourced, what others like Chris have reported and considering the characters involved. If the Bengals and Seahawks have agreed suitable compensation, Carson Palmer will be the next starting quarterback of the Seahawks. If the Bengals play hard ball on the price or make new demands – and let’s be fair here, these are talks that could be happening right now for all we know – then the Seahawks are more likely to be aggressive in their pursuit of re-signing Matt Hasselbeck. The end result? Palmer or Hasselbeck in Seahawks blue. That’s what we said months ago, that’s what we’d say now. I spoke earlier this week about my admiration for Southern Miss quarterback Austin Davis. His numbers are impressive – in three years with the Golden Eagles, he’s claimed most of Brett Favre’s quarterback records and notched 74 total touchdowns compared to just 16 interceptions. Last year he passed for 3103 yards, ran for 452 more and scored 30 total touchdowns. He completed 63% of his passes. He’s an athletic quarterback not only capable of making plays with his legs, but also avoiding pressure. Despite playing behind a suspect offensive line, he was sacked just 17 times. Cam Newton was sacked 23 times in 2010, Greg McElroy was sacked 30 times at Alabama and Matt Barkley – with Tyron Smith and Matt Kalil on the offensive line at USC – 16 times. Although he doesn’t have the cannon arm, it’s certainly not a weakness. I’m led to believe he’s added weight and improved from a 2010 listed 208lbs to 220lbs for the upcoming season, which could improve his arm strength if it’s upper-body muscle. Certainly he had room on a frame that measures around 6-2 to add some muscle. Is the height an issue? He doesn’t look small on tape and certainly I didn’t notice any issues with passes being batted down at the line of scrimmage. His passing technique is sound, including release and weight distribution. Davis reportedly drew rave reviews at the Manning Passing Academy recently, which was attended by Andrew Luck and other top name QB’s. He supposedly impressed Archie Manning in particular and reached the final of the accuracy drills alongside Landry Jones. Indeed the weight gain, if it’s in the right areas, makes me believe this is a guy that truly appreciates what he has to do to max out his potential. If he maintains his athleticism with the extra weight, continues to put up productive numbers and potentially leads Southern Miss to an unbeaten season against a favorable schedule, then I’m convinced he’ll improve his stock to a national level and not just this blog. At the moment I have Davis with a grade in rounds two or three, with room for improvement. He’s right up there with Kirk Cousins and Landry Jones and warrants a lot more discussion than people are giving him right now.